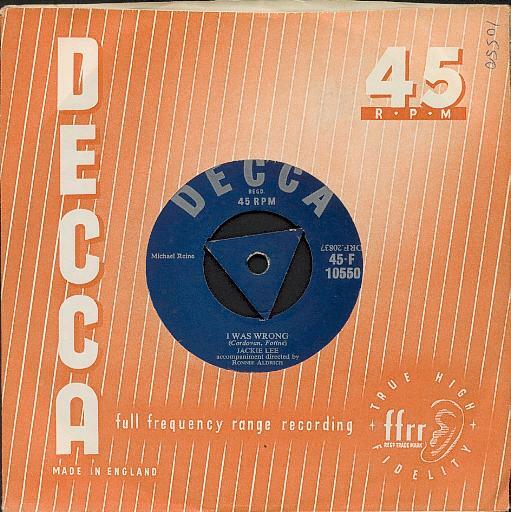 JACKIE LEE I was wrong / For as long as I live Decca F10550, issued as both 45rpm and 78rpm, July 1955. 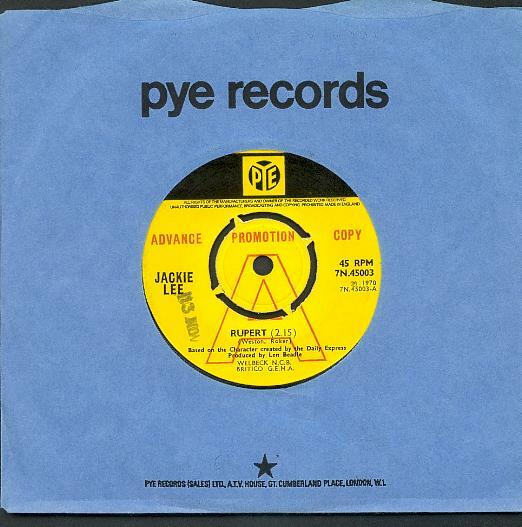 Both sides of Jackie's debut single were arranged by Ronnie Aldrich. Two ballads, very much of their time. Jackie's singing is impressive but it would be a few years before her voice fully developed. JACKIE LEE On the outskirts of Paris / Love me as though there were no tomorrow Polydor BM6030, 1956, issued as 78rpm only. 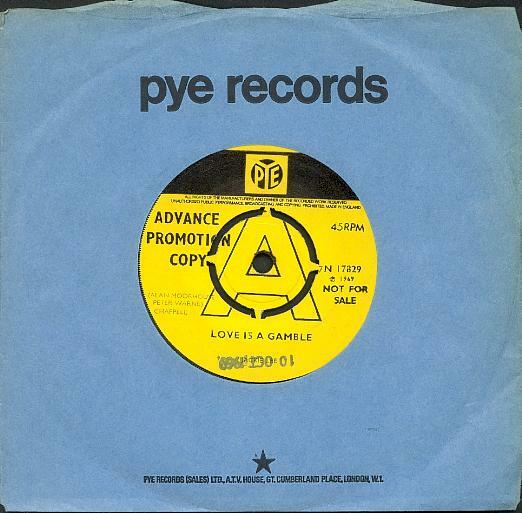 Paul Vance-Lee Pockriss A-side. Sold in miniscule quantity and consequently next to impossible to find now. There is also believed to be a single from this time issued as Jacqueline Fleurette or some variation of that name. 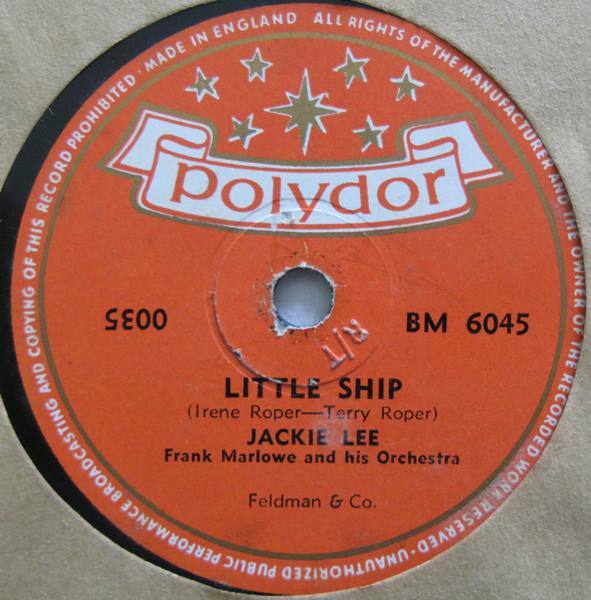 JACKIE LEE Little ship / To be sure Polydor BM6045, 1956, issued as 78rpm only. Issued in December 1956, this is the rarest British release by Jackie. 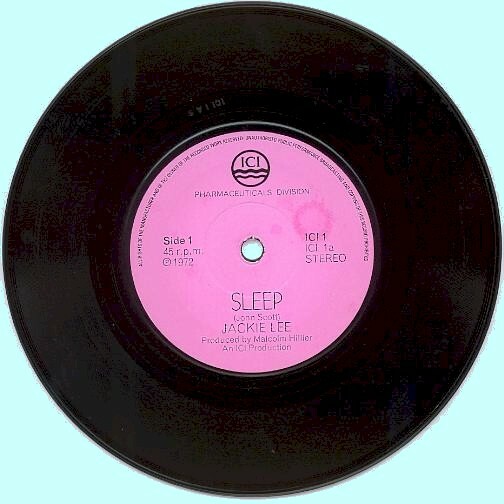 Jackie can recall the lyrics to the B-side over fifty years later: "Is this the love I have waited for, I smile and say to be sure, to be sure, and will this love last forever more I smile and say to be sure". It has been suggested (thanks Bob!) that some or all of the four recordings Jackie made for Polydor could have been engineered by Joe Meek. 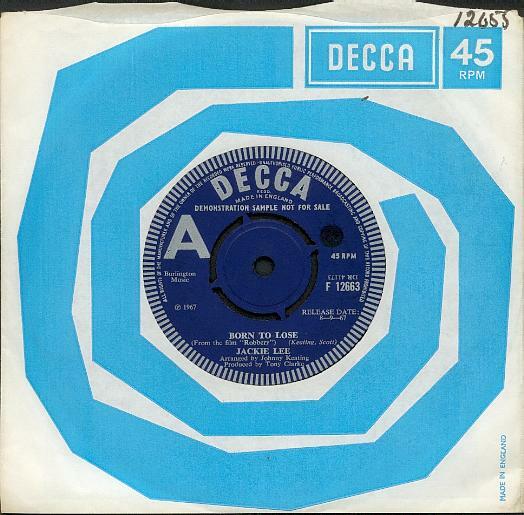 RAINDROPS Italian style / Along came Jones Parlophone R4559, 1959. A Len Beadle-Johnny Worth composition backed by the Lieber-Stoller number. More American sounding than many of the other Raindrops tracks. 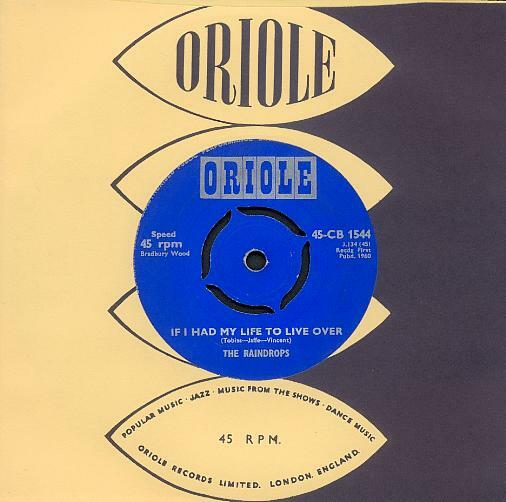 RAINDROPS If I had my life to live over / Let’s make a foursome Oriole CB1544, 1960. The B-side, which has a nice rave-up in the middle, was composed by Frank Weston who, a decade later, would compose 'Rupert'. This is less intriguing than it sounds. Weston was actually Len Beadle. 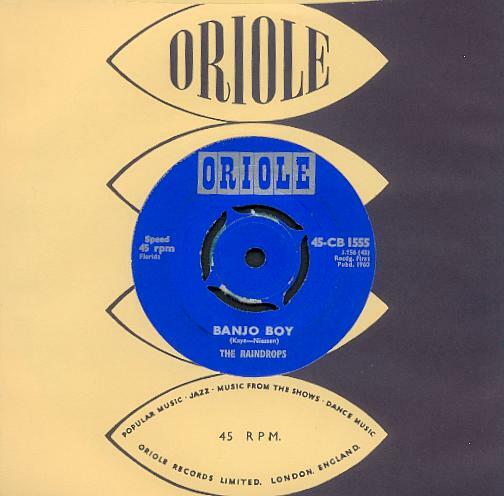 RAINDROPS Banjo boy / Crazy rhythm Oriole CB1555, 1960. Cover of the hit by Danish duo Jan & Kjeld, backed with a nice swinging tune. 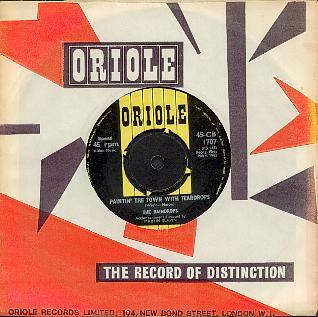 Two other songs recorded at this time appeared on the Oriole compilation 'It's All Happening Here!'. See end of this Discography. 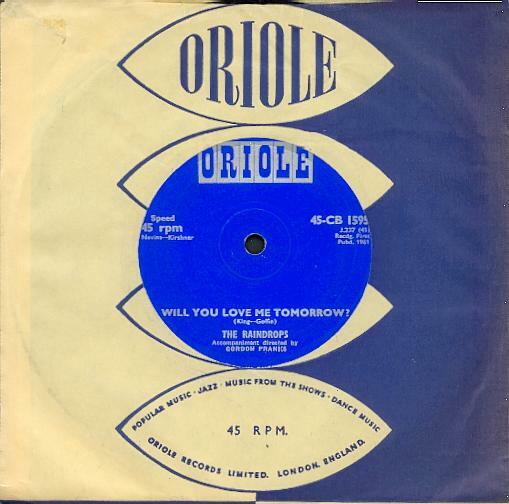 RAINDROPS Will you love me tomorrow / Raindrops Oriole CB1595, 1961. Beautiful version of Gerry Goffin and Carole King's classic weepie. Jackie's voice has greater prominence on this single. Easily the finest of the early Raindrops singles. 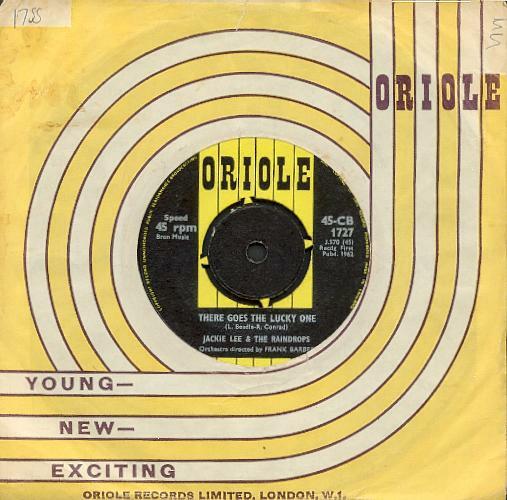 JACKIE LEE & THE RAINDROPS There’s no-one in the whole wide world / I was the last one to know Oriole CB1702, 1962. Cute! 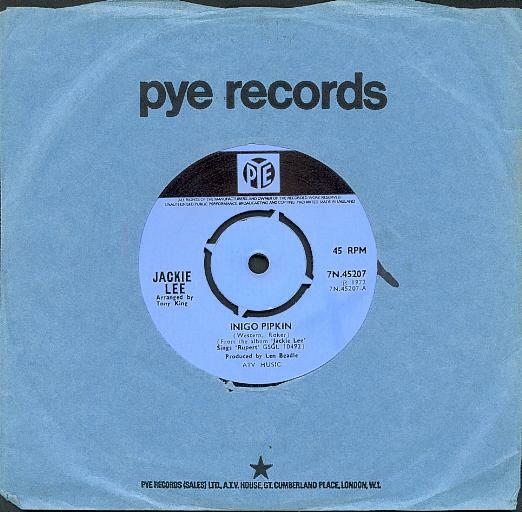 The first recording to bear Jackie's name for six years and a new label design. 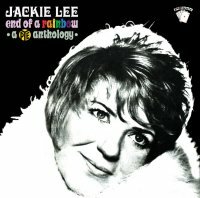 Jackie sang the A-side in the British national finals of the Eurovision Song Contest at BBC TV Centre in February 1962. But still it was not a hit. Jackie's vocal is noticeably forward in the mix, and is more readily identifiable. A Beadle-Conrad B-side. The Beatles performed There's no-one in the whole wide world, a favourite of George Harrison, in concert during 1962. RAINDROPS Paintin' the town with teardrops / A letter from Anne Oriole CB1707, 1962. Two obscure covers given the Raindrops treatment. JACKIE LEE & THE RAINDROPS There goes the lucky one / I built my world around a dream Oriole CB1727, 1962. Also issued in the US on the private Jaylee label [see Discography part 2]. 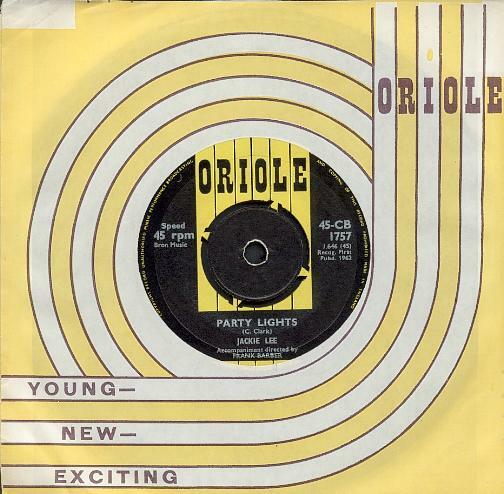 JACKIE LEE Party lights / Midnight Oriole CB1757, 1962. A driving cover of Claudine Clark's big hit with Jackie's ebullient vocal pushed on by some great drumming. This is backed by a delicious uptempo Beadle-Conrad song. It probably sounded quite dangerous in 1962. You might still need a licence to listen to it now. Copies are inexplicably scarce and it does not appear to have been issued outside of the UK. 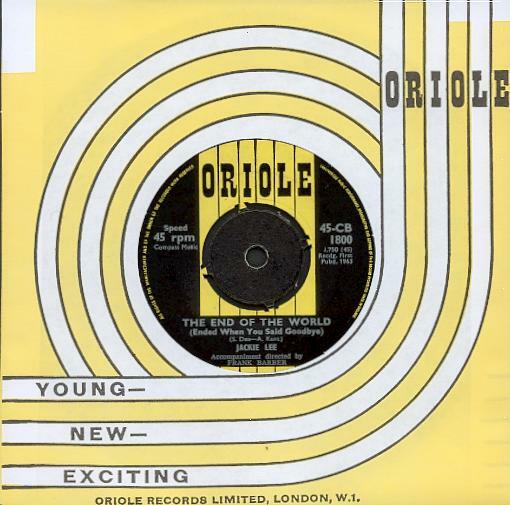 JACKIE LEE The end of the world / Goodbye is such a lonely word Oriole CB1800, 1963. Jackie's vocal is stronger and more mature sounding on this great version of the Skeeter Davis hit, with a strong Beadle-Conrad B-side. Well worth seeking out. Also issued in Denmark with a picture sleeve [see Discography part 2]. JACKIE & THE RAINDROPS The loco-motion, 1963. 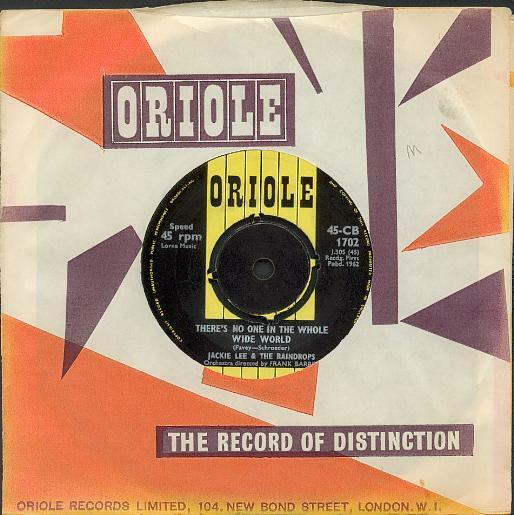 Recorded for Oriole but issued by Decca on the Just For You soundtrack album [see Discography part 3]. 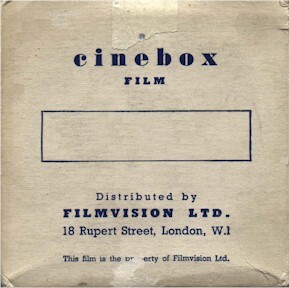 A Cinebox 16mm film was made for video jukeboxes featuring the same performance as used in the film. 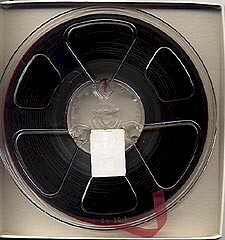 Click on the tape reel above and take a deep breath. JACKIE & THE RAINDROPS Maybe it's the Madison, 1963. Only rediscovered in 2003, this song gained no commercial release. A short film was made at De Lane Lea in which the Raindrops are accompanied by dancers doing, well, the Madison. Only available on a Cinebox 16mm film, and thus probably winning a prize for instant obsolescence and future collector hell. JACKIE & THE RAINDROPS Down our street / My heart is your heart Philips BF1283, 1963. A beat-tastic classic. Two sterling songs written by Beadle and Conrad, delivered in rowdy uptempo beat mode from Jackie. The flipside has a marvellously cheesy chorus with some lovely harmonies. Issued in the US on Colpix [see Discography part 2]. The A-side is available in poorly mastered lo-fi on Sequel's 'Colpix-Dimension Story' compilation CD [see Discography part 4]. JACKIE & THE RAINDROPS Come on dream, come on / Here I go again Philips BF1328, 1964. Another two brilliant songs from Messrs Beadle and Conrad. The harmonies on the A-side are gorgeous. The most sought-after Raindrops single. 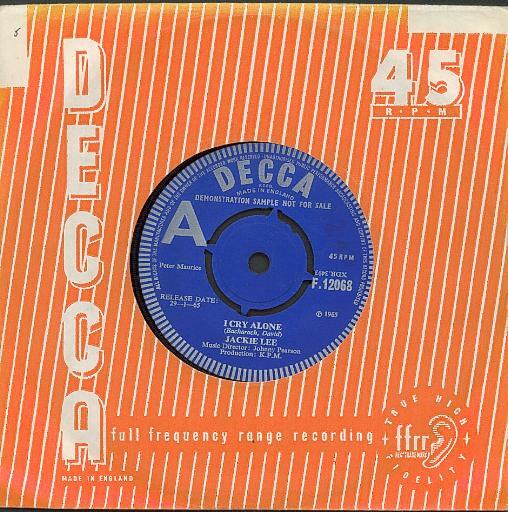 One more Raindrops song turned up on the Decca soundtrack to 'Just For You' (see Discography part 3), but the group was no more. All subsequent releases are Jackie Lee solo efforts. 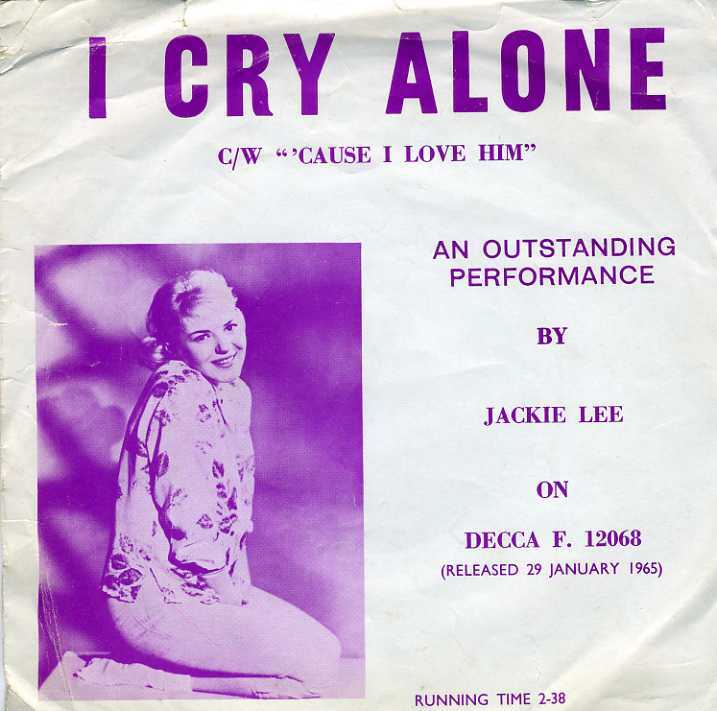 JACKIE LEE I cry alone / ‘Cause I love him Decca F12068, January 1965. This was the first indication that Jackie's voice was really something special. 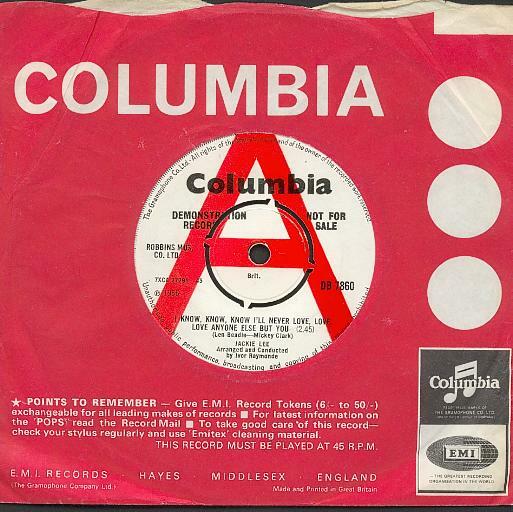 The simple arrangement of the Bacharach-David A-side, originally recorded as a demo for Keith Prowse Music, featuring subdued acoustic backing, allowed her to be heard properly. A Radio Caroline favourite in early '65. The B-side is more uptempo with great American girl group-styled harmonies and a beating rhythm. Issued in the US on Epic [see Discography part 2]. 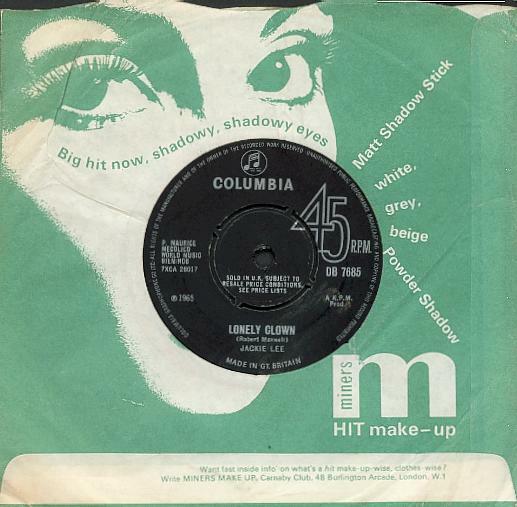 JACKIE LEE Lonely clown / Love is gone Columbia DB7685, September 1965. 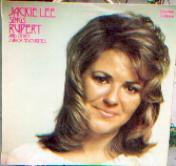 The A-side, introduced by gorgeous mellow trumpet, shows Jackie's full range from soft and sultry to Brit-soul torment. The flipside, co-written by Len Beadle with Barry Mason, is equally strong. Both sides are beautifully arranged and have more superb backing vocals. Issued in the US on Epic [see Discography part 2]. 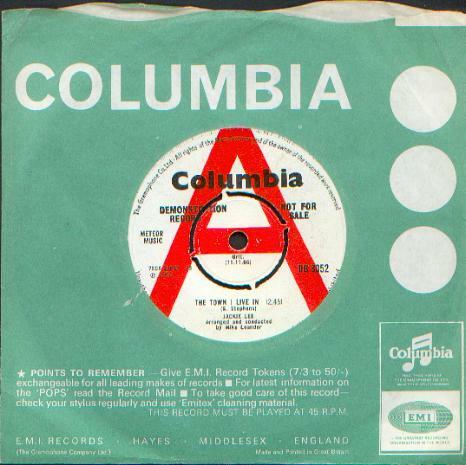 JACKIE LEE I know know know I’ll never love love love anyone else / So love me Columbia DB7860, March 1966. Sublime backing vocals by the Barbara Moores (Barbara, Jackie and unknown others). Both sides co-written by Mr Beadle. 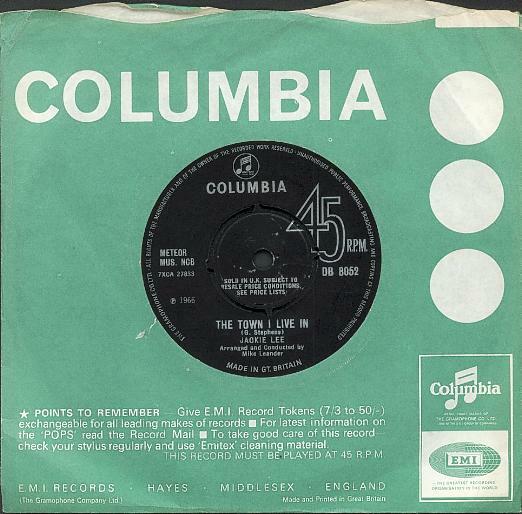 The continental-sounding A-side, which originally had the less attractive but somewhat shorter working title of Loving you the way I do, would not have been out of place as a Eurovision entry (that's intended as a compliment). 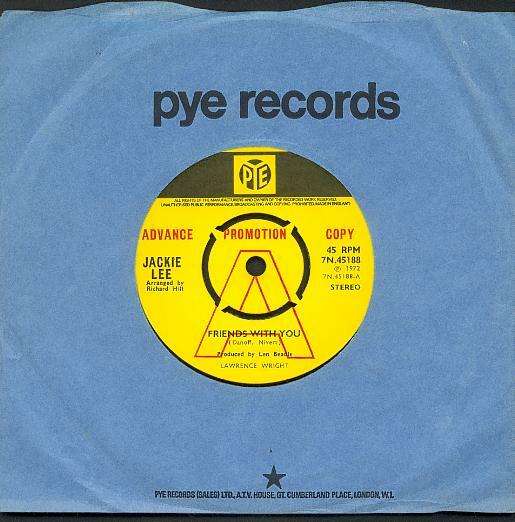 The B-side, featuring Don Lusher on trombone, sounds very much like Jackie's later work for the Pye label, and was worthy of promotion as the lead track. Produced by Ivor Raymonde. 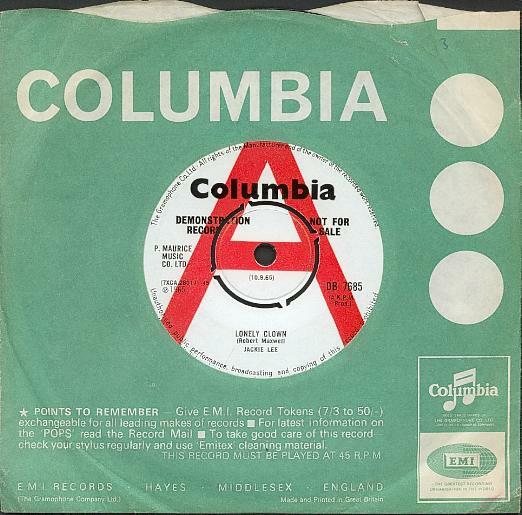 JACKIE LEE The town I live in / You too (can have heartaches) Columbia DB8052, November 1966. Bit of a classic. From the opening notes, you know this is going to be a corker, and it is. One of Jackie's best known non-hits. 'Cos the town I live in has 27 churches, la la la la la la la, and avenues lined with silver birches, la la la la la la la'. Other side is a gem too. The A-side is available on RPM compilation CD 'Dream Babes vol.1' [see Discography part 4]. EMMA REDE Just like a man / I gotta be with you Columbia DB8136, January 1967. A nearly hit from the same October '66 session which yielded The town I live in. Loads of hooks, decidedly non-PC lyrics. Should have been huge, but wasn't. 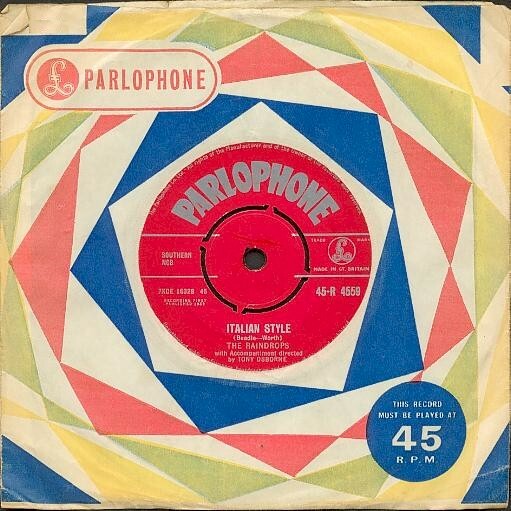 Nowadays highly sought-after, particularly by British Northern soul fans, for the masterpiece hiding on the B-side which is justifiably regarded as a career highpoint. A slow build up leads to an impassioned chorus with some stunning vocal acrobatics at the close. Guaranteed to make grown men weep. Some sources list The Breakaways as backing vocalists on these recordings, but Jackie has no memories of these session singers being involved. Issued with non-dinkable solid centre as well as standard EMI four-prong dinkable. This single was also issued in Germany; it is believed all of the EMI singles were issued in Europe although this has yet to be confirmed. The B-side is available on RPM compilation CD Dream Babes vol.1 [see Discography part 4]. Just like a man was of sufficient continental interest to merit covers in both English and Dutch by Conny Vandenbos, and in German by Simone. EMMA REDE Window cleaner / Ever or never at all unissued, 1967. A second Emma Rede single was planned, but for some reason progressed no further than acetate stage. The A-side is archetypal acoustic pop whimsy of the era with subtle string arrangement and soft vocal, very similar to that of the later White horses, while the flipside is a pounding uptempo soul track. The cancellation of this single is a complete mystery. 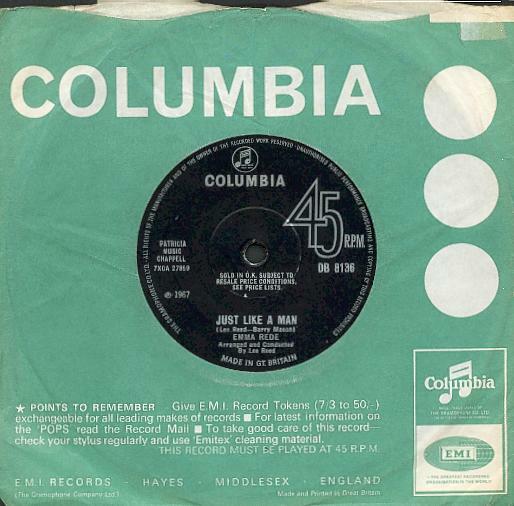 Both sides were recorded in stereo, and a further four unreleased songs recorded as Emma Rede exist, strengthening the case for a compilation of Jackie's EMI work. 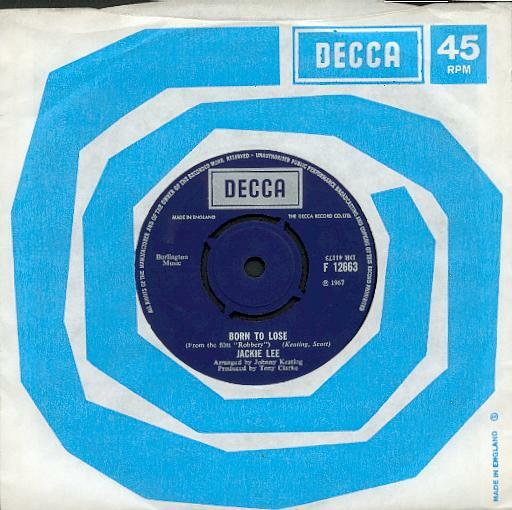 JACKIE LEE Born to lose / Saying goodbye Decca F12663, September 1967. Maintaining the high quality of the four EMI singles, this song from Johnny Keating's Robbery! movie soundtrack is another hit that wasn't. Strident brass arrangement shows Jackie in a different light. The other side is a moving ballad with xylophone, tambourine and orchestral backing. 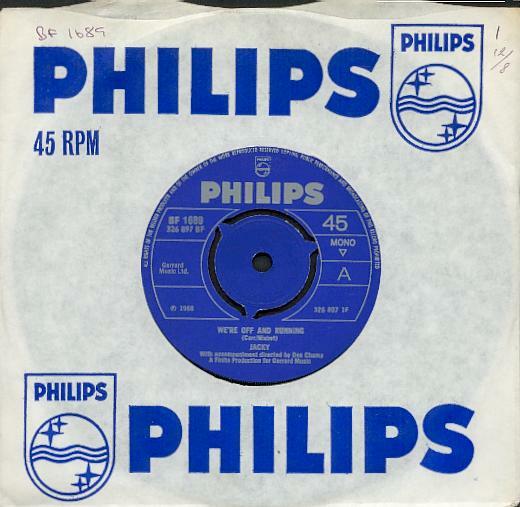 JACKY White horses / Too many chiefs (not enough Indians) Philips BF1647, January 1968 Reached No.10 in the British Top 50. Deleted 1971. A song which has firmly embedded itself in the subconscious of a generation, as a result of being the theme to a summer holiday TV series. Leading session-man Big Jim Sullivan, between sessions for Petula Clark and Scott Walker, contributed the memorable guitar part. 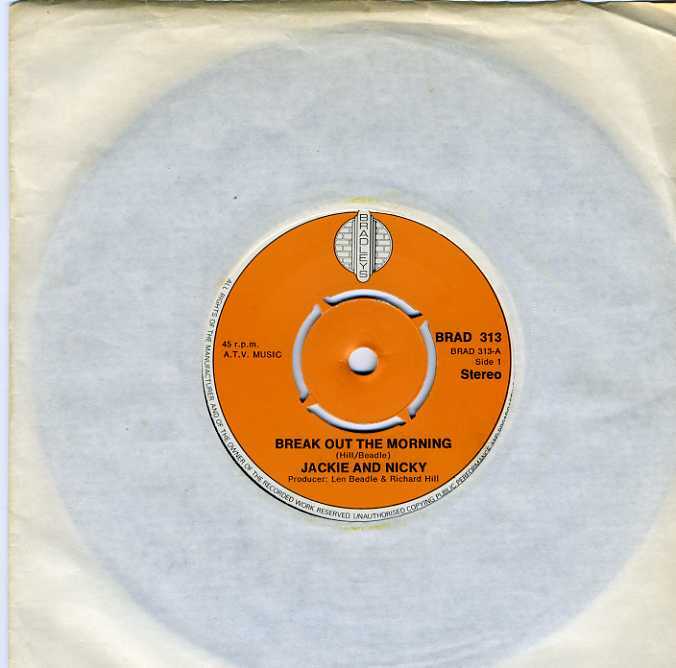 The B-side is really the first Jackie song expressly aimed at children, although it has redeeming features in Jackie and Barbara Moore's sweet backing vocals and the nice period references to Arnold Palmer (and the George & Dragon). 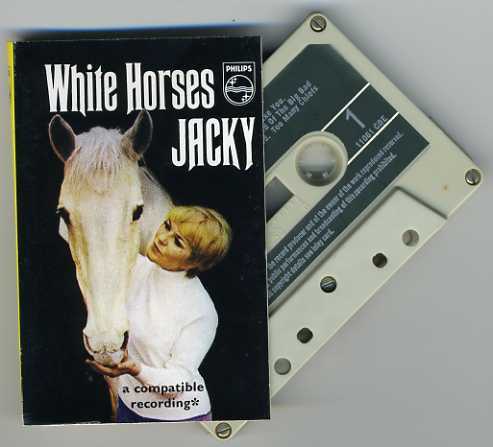 'White horses' remains a cult favourite and has been covered by Trixie’s Big Red Motorbike, Trash Can Sinatras, and comedienne Morwenna Banks, among others. It was used as the theme tune for Sandra Goldbacher's 2001 movie 'Me Without You' [see Discography part 5], although Jacky's version is not featured on the soundtrack CD. In 2006, Clarks' Shoes featured the song in a British TV commercial. The song also provided inspiration for the vocal melody on the Ride track 'Welcome to paradise' (see sleevenotes for the OX4 3CD set issued by Ignition in summer 2001). In 2000, saxophonist Iain Ballamy recorded variations of 'White horses' for his 'Pepper St Interludes' album. Issued by Philips in the US and various European territories [see Discography part 2]. 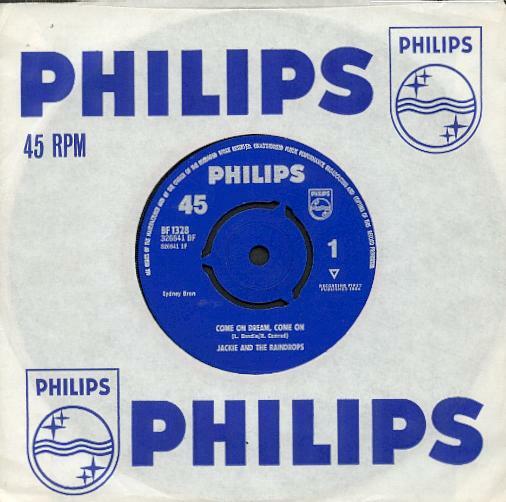 JACKY We’re off and running / Well that’s loving you Philips BF1689, July 1968. Trite perhaps, but still a perfect summery song. The B-side is preferable, and was the first self-composed (with Barbara Moore) song Jackie recorded. Nice vibes, brass and a strong rhythm. 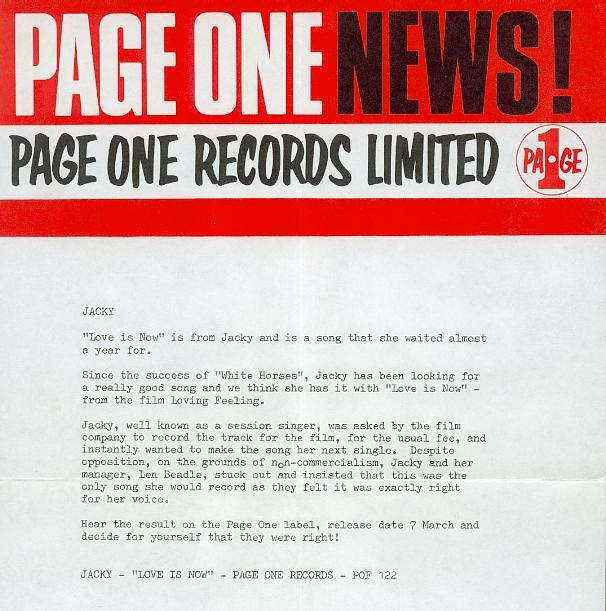 JACKY Love is now / Never will I be Page One POF122, March 1969. A one-off for Larry Page's label, the A-side is an epic, adventurous track opening with soft, dreamy vocal, building to an explosive bridge. 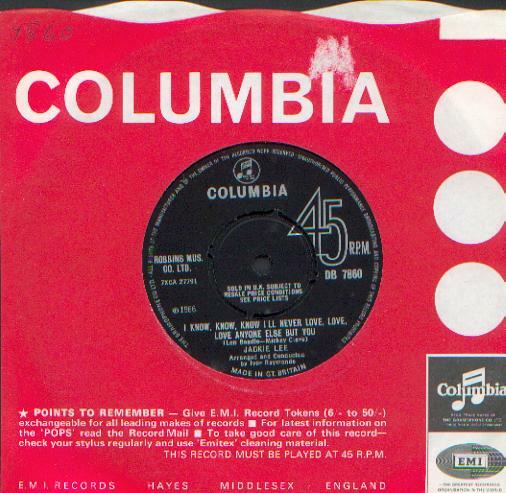 Originally recorded by Jackie with John Scott as a demo for the film 'Loving Feeling', the single was arranged by Christopher Gunning as his remarkable professional debut. '...Those dragonflies, summer days, all have gone in a haze of goodbyes...' A spine-tingling, monumental masterpiece. Early arrangements of the song predominantly feature organ and rhythm section - the vocal was first recorded by Alma Warren, but Jackie replaced her at short notice and recorded the song with an identical arrangement. It is the latter version which was used for the movie main theme. 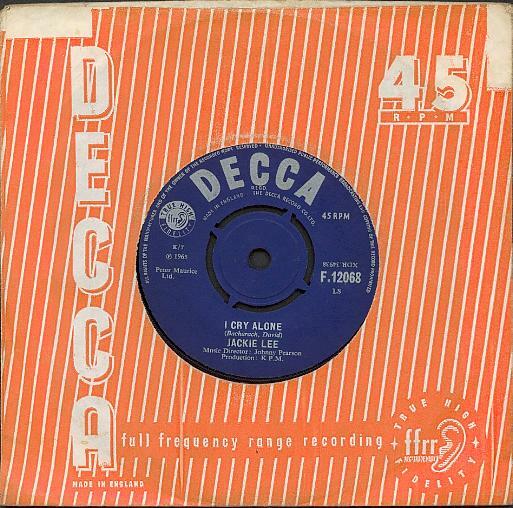 The final orchestral arrangement was influenced by John Scott's work with The Hollies on their King Midas in reverse. The Jackie Lee-Barbara Moore B-side is an equally brilliant orchestral ballad, with strings swelling behind Jackie's passionate vocal. It ends too soon though! Producer listed as 'Finito', which was the management team of Adrian Rudge and Tony Palmer. Actually some labels credit simply Finito, and others list Finito & Len Beadle. Some labels also misspell the arranger's surname as Gunner. Clearly quite a number were pressed, although it made no impression whatsoever on the charts. Far too... good. 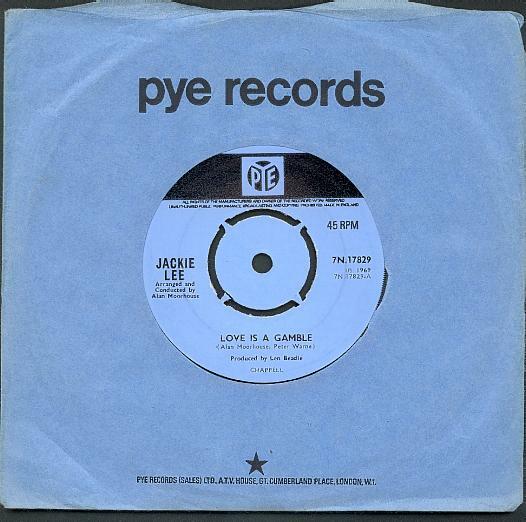 JACKIE LEE Love is a gamble / Something borrowed, something blue Pye 7N17829, October 1969. 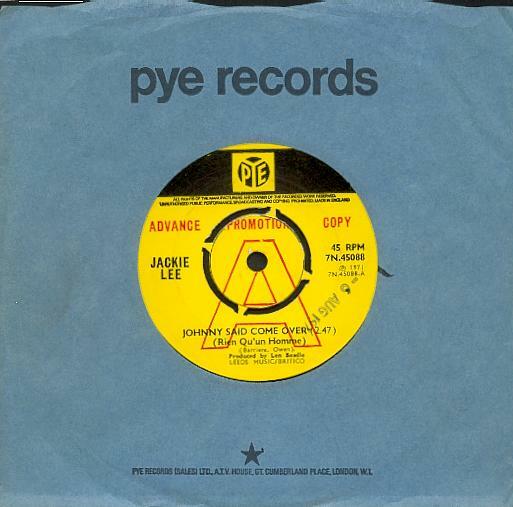 Jackie's Pye career began, rather anti-climactically after the Page One single, with an Alan Moorhouse song backed with a reflective ballad co-written by Jackie with Christopher Gunning. Subtle touches of trumpet on B-side. The A-side is available on the compilation CD 'Here Come The Girls vol.8' [see Discography part 4]. 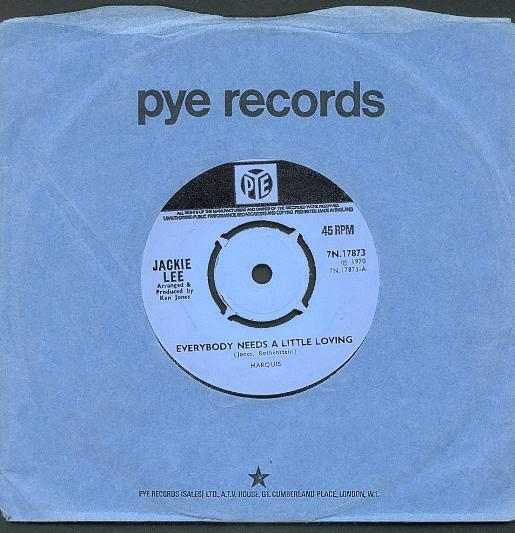 JACKIE LEE Everybody needs a little loving / If every day was like today Pye 7N17873, 1970. The Ken Jones A-side was originally used as a TV commercial for Campbell's Soups, albeit in a slightly different arrangement. Chris Gunning's arrangement of the Gunning-Lee B-side features nice echo on the piano and interesting use of percussion. Quite adventurous in an understated way. 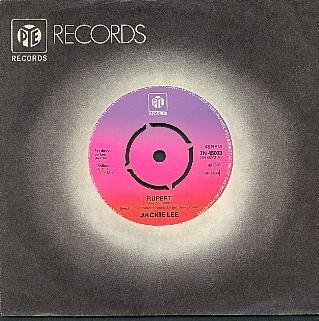 JACKIE LEE Rupert / Going to the circus Pye 7N45003, November 1970 Reached No.14 in the British Top 50. Deleted January 1974. Big Jim Sullivan added his magic touch to Rupert, making it the only other chart hit Jackie was to have. Just like White horses, Rupert has gained cult status, and has been recorded by numerous fey British acts (and the Toy Dolls). Issued throughout Europe, including a German language version [see Discography part 2]. JACKIE LEE One more mountain / What will I do? Pye 7N45072, September 1971. 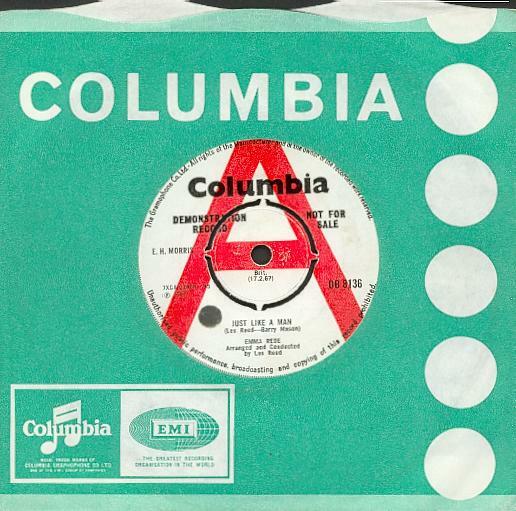 Written by Neil Sedaka and Howard Greenfield, this was Jackie & Christopher Gunning's British entry into the Polish International Song Festival, held in Sopot. The prestigious festival was organised by the Polish Ministry of Culture and Art and subsequently evolved into an Eastern Bloc Eurovision affair. Jackie's song was runner-up to the entry from the USSR. Although undeniably a powerful and moving rendition of the song, it's not one of Sedaka's best, and Jackie's vocal is partially submerged beneath Chris Gunning's arrangement. The production merits a gold star, however, for some subtle phasing on the strings. The songs fades on what sounds suspiciously like a church organ. All rather strange. 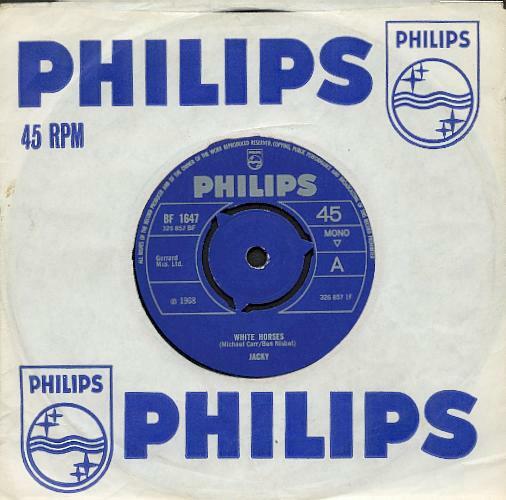 Very tasty B-side reprised a few months later with Peter Pan (see below). 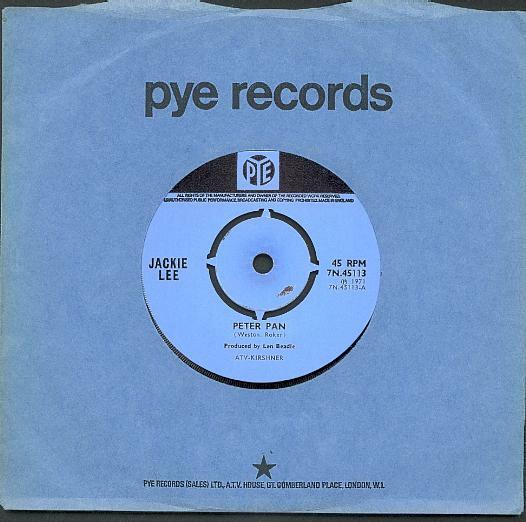 Inexplicably this is the most difficult to find of Jackie's Pye singles. It may not have gone further than promo stage, and could well have been cancelled when Samantha Jones released the same song as a single. 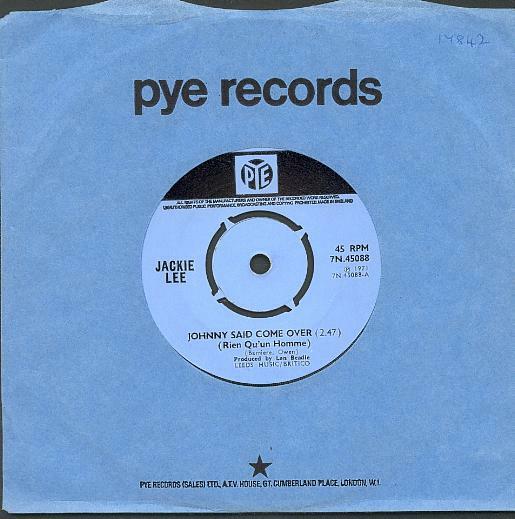 JACKIE LEE Johnny said come over (Rien qu’un homme) / End of a rainbow Pye 7N45088, August 1971. 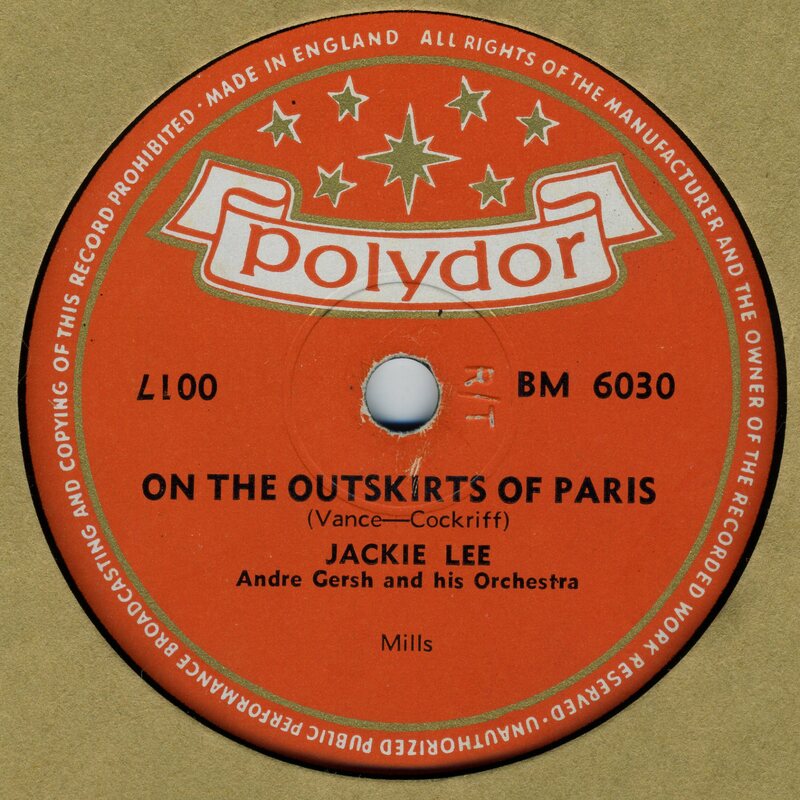 An English recording of a French song backed with a different version of a track from the Junior Choice LP - the album version is orchestral, the single has keyboards. Issued in the Philippines with a different B-side. No, really. JACKIE LEE Peter Pan / What will I do? 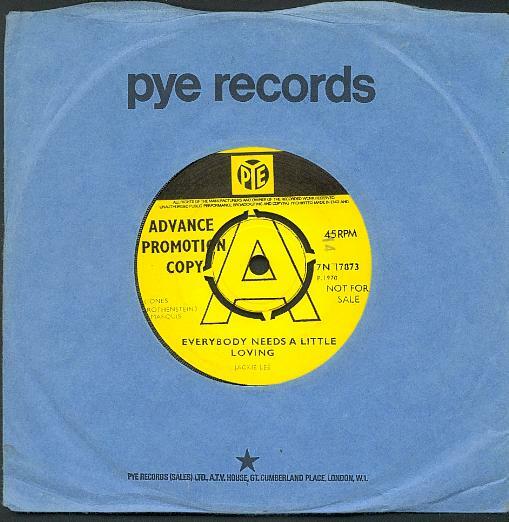 Pye 7N45113, 1971. Pounding song for the kids which may or may not have been a genuine theme tune. Well worth having for the delicious B-side alone which has a beautiful coda with Jackie's wordless vocal following the trumpet. 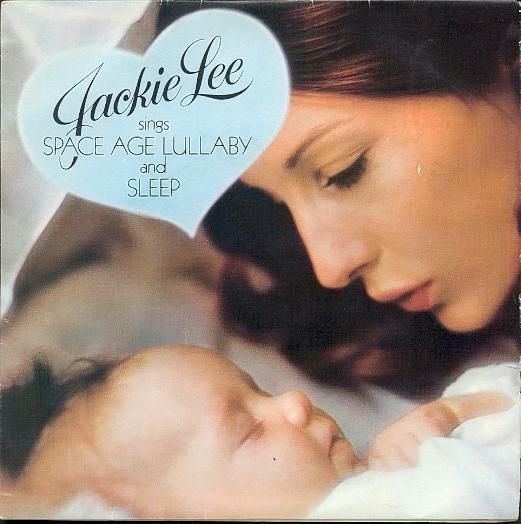 JACKIE LEE Sleep / Space age lullaby ICI ICI1/2, 1972. Arranged by John Scott. Not quite up to the standard of the Loving Feeling soundtrack, but a pleasant enough ballad. The B-side has pretty far-out lyrics would have disturbed any junior listeners, had they understood them. Given away with Savlon babycare products. In 1984, 'Sleep' was used in a Channel Four movie for reasons not yet ascertained. The film was either Ptang Ptang Kipperbang, Those Glory Glory Days, or Sharma & Beyond. Or it may have been Secrets. 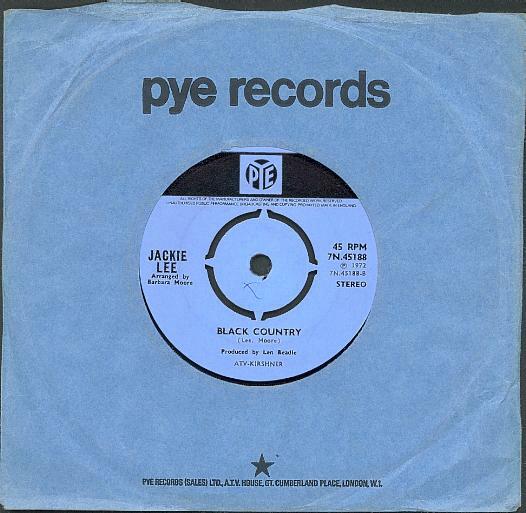 JACKIE LEE Friends with you / Black country Pye 7N45188, October 1972. Both sides splendidly arranged. The B-side, written by Jackie with Barbara Moore, is one of Jackie's finest moments. Superb tight rhythm section, great over-dubbed soulful harmonies by Jackie and Barbara. Jackie's lyrics, while ostensibly concerned with coalfields in the West Midlands, could be interpreted as a reflection on her disappointment at the way her career in music had gone ('...so I'm on my way back, leaving nothing behind' with the emphasis on nothing). Evocative harmonica part is supplied by none other than Tommy Reilly who Jackie first worked with way back in the days of Workers' Playtime with the Raindrops. 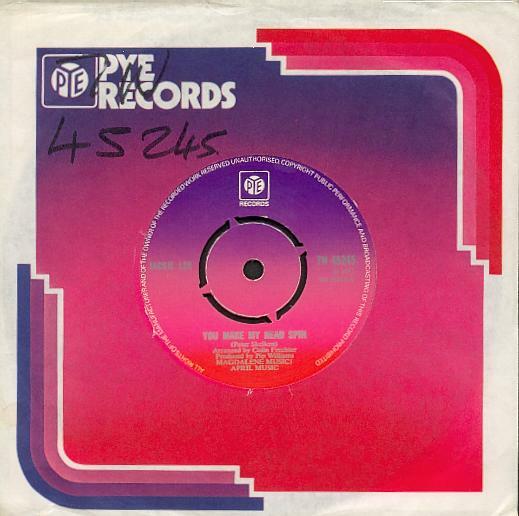 JACKIE LEE Inigo Pipkin / End of a rainbow Pye 7N45207, December 1972. 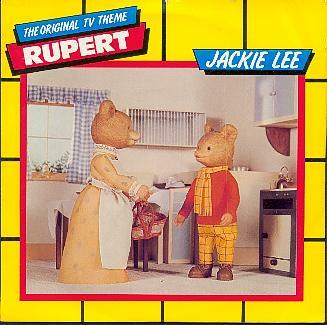 Sandwiching two excellent, mature records was this theme tune to another children's TV series. Inigo Pipkin ran on ITV from 1972 to 1976, then continued as Pipkins until 1981. The original titles for the TV series featured a highly edited version of the song. 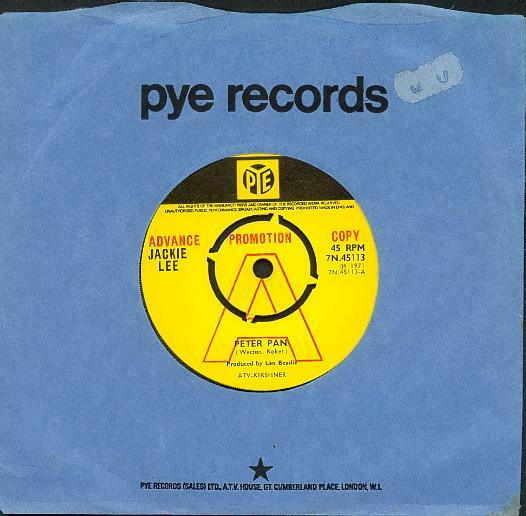 JACKIE LEE You make my head spin / Hallelujah lamb Pye 7N45245, 1973. Jackie's final single. The Peter Skellern composed A-side is available on the CD compilation 'Here Come The Girls vol.6' [see Discography part 4]. Jackie's voice is beautifully recorded, and the song develops through some interesting changes. On the B-side, Jackie's vocal sounds very tired at the open and close of the song, which is exacerbated by poor mixing. By this time Jackie had suffered problems with her vocal cords, and it is more than likely that this song was recorded earlier in 1972. 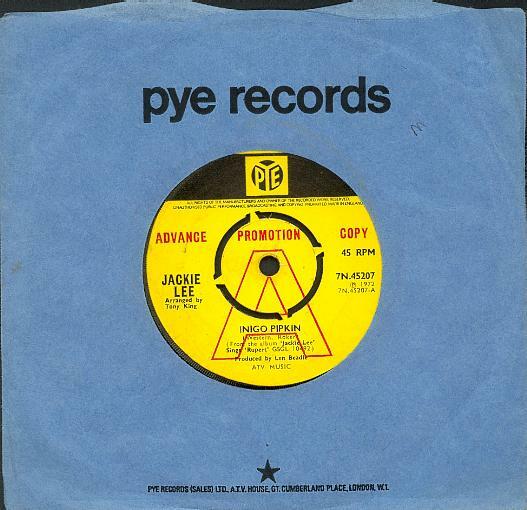 JACKIE LEE Beautiful city Pye unissued single, 1973 This song from Godspell is believed to have been scheduled for release but failed to make it even as far as a test pressing despite achieving a final mix. Jackie is backed on the song by orchestra and chorus, but the arranger and producer are unknown at present. Possibly the work of Tony Palmer. JACKIE & NICKY Break out the morning / Children of love Bradleys BRAD313, 1974 Recently discovered final recording issued by Jackie. The uptempo A-side is a Len Beadle-Richard Hill co-write and features fairly complex arrangement. Good vocal from Jackie and her singing partner Nicky Carter. The B-side is a painful christian rock hymn written and arranged solely by Hill. JACKIE LEE Rupert / Going to the circus PRT 7P337, December 1985. Reissue. 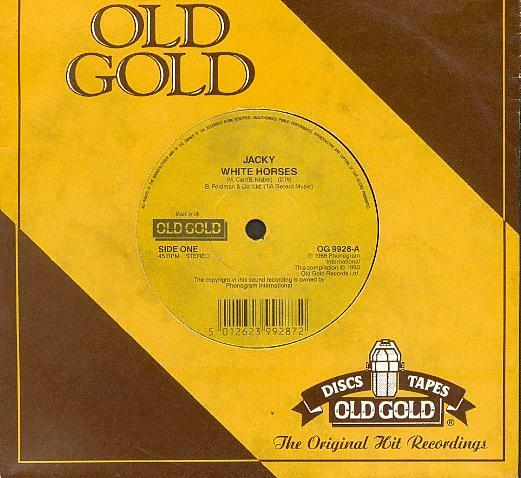 JACKY White horses / VICKY LEANDROS Old Gold OG9928, 1990. Reissue. Scarcer than the Philips original. JACKIE LEE Barbarella (unused main theme) Harkit HRKEP8508, 2014. Bootleg EP featuring three songs from the movie soundtrack in hideous quality, plus Jackie's original theme recorded with Michel Magne. It sounds as if it was mastered from a low resolution MP3. The only legitimate source of Jackie's performance, which is one of her absolute best recordings, is a Universal France CD titled Soundtracks From The Films Of Roger Vadim. 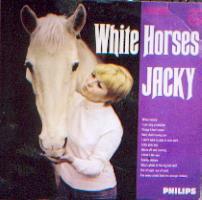 JACKY White Horses Philips BL7851 [mono] / SBL7851 [stereo], August 1968. 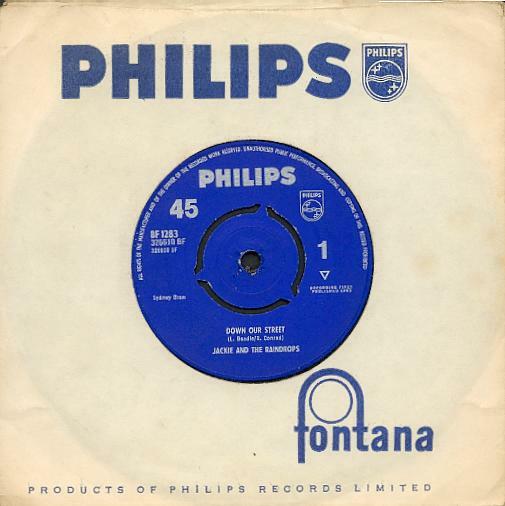 Bankrolled as an independent production by Ben Nisbet and sympathetically recorded by Finito at Pye Studios near Jackie's sometime Baker Street home. 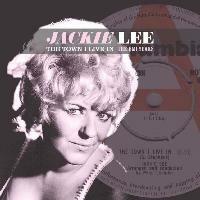 Features three songs written by Jackie with Barbara Moore, all backed by quality arrangements: Well, that's loving you, Things I don't mean (which moves up a gear for an extraordinary piano solo by Dudley Moore), and Out of sight, out of mind (with double-tracked vocal on the chorus). All tracks were chosen by Jackie with Tony Palmer and no unissued tracks are believed to exist. It's a great shame Jackie was not given the opportunity to stretch out more with material like this. There's also an interesting version of Who's afraid of the big bad wolf - a nursery rhyme in the style of Cleo Laine and Johnny Dankworth. The album version of We're off and running is a completely different arrangement from the single. Now a very rare and expensive item. The cassette version is a real oddity. Far more elusive even than vinyl copies, it has completely different running order, opening with We're off and running. 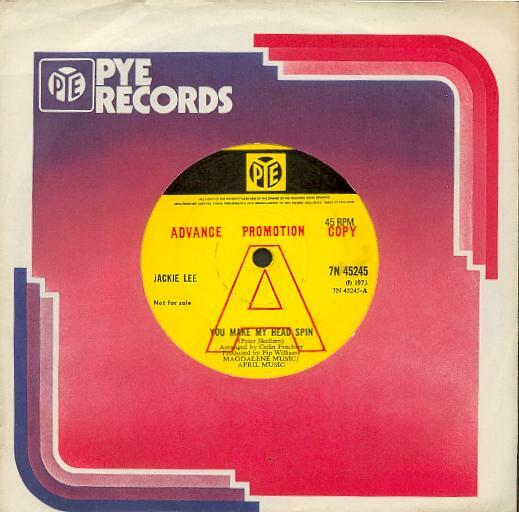 JACKIE LEE Jackie’s Junior Choice Pye Special PKL5503, September 1971. With lyric sheet and colour-in drawing of Jackie. Strategically placed Rupert doll, child and story book on the cover. Covers of songs by the Beatles, Sweet, White Plains, and others. And right to the end, who was behind the desk? Mr Len Beadle. The album even features a cheeky recording of Hoagy Carmichael's Lazybones, which The Raindrops used to perform on stage ten years earlier. The highlight is probably Neil Sedaka's I'm a song, the lyrics of which could provide a fitting epithet to Jackie's career: "I got music...doesn't anyone care?" 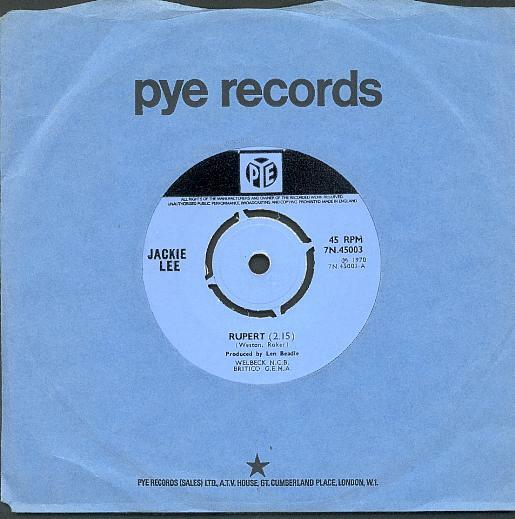 JACKIE LEE Jackie Lee Sings Rupert Pye Golden Guinea GSGL10492, 1972. 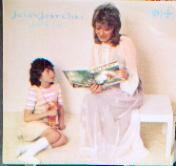 A reissue of the Junior Choice LP with different artwork, and with Peter Pan replacing Johnny said come over, and Inigo Pipkin in place of Here we go round again. JACKIE LEE End Of A Rainbow Poker DECKCD107, 2007 CD. Finally, an official compilation of Jackie's work. 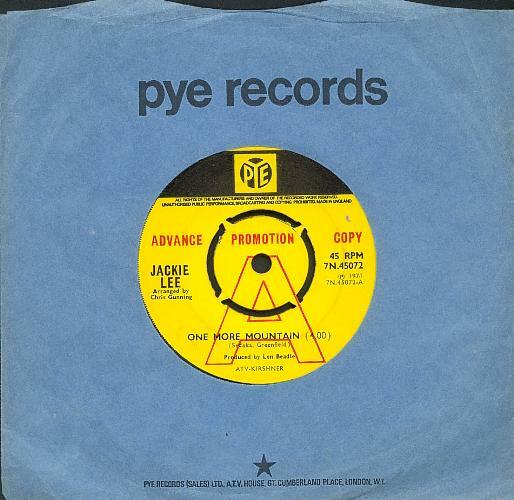 This first volume of an intended three disc set collects all of Jackie's recordings for Pye Records. It includes all Pye singles and the album tracks, plus one previously unissued track (Beautiful city) and the German version of Rupert. The only recordings omitted are the mono masters of One more mountain and What will I do (both presented on the CD in full stereo for the first time), the (incomplete) single version of the title track, and a demo version of Friends with you which exists only on a distressed acetate. Click on the link above to order from Amazon. JACKIE LEE The Town I Live In Poker DECKCD113, 2009 CD. A second volume of Jackie's work, this time collecting all of her Abbey Road recordings. Half the titles are previously unissued, and included is an early take (actually take 1) of the title track. All Abbey Road tracks are from the original session tapes, and sound fantastic. This essential collection represents Jackie at her artistic peak.